EDWARDSVILLE, Pa. – Freshman Kiandre Burrell rushed for a pair of touchdowns and the Stevenson University defense forced three turnovers as the Mustangs maintained a share of first place in the Middle Atlantic Conference with a 31-14 football victory at Wilkes University Saturday afternoon at Schmidt Stadium. With the win, the Mustangs (7-1, 6-1 MAC) keep pace with Albright and Delaware Valley for first place in the conference as both the Lions and Aggies were winners on Saturday. 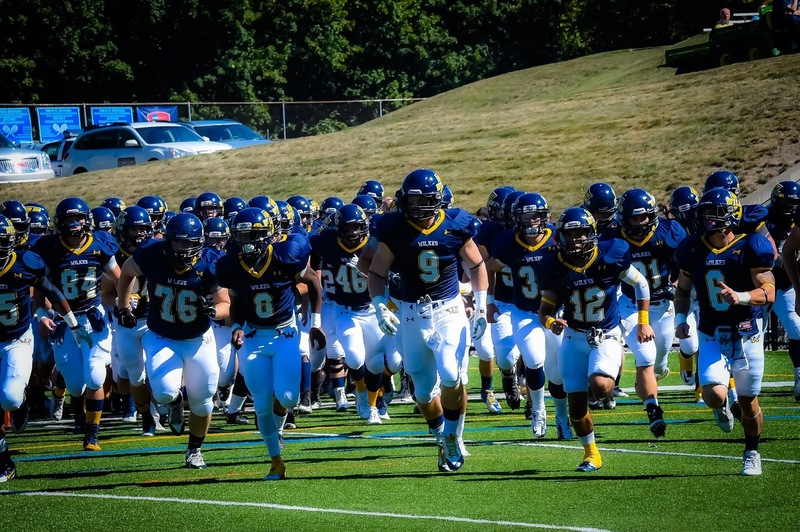 Stevenson hosts Albright next Saturday (Nov. 7) in a key contest at 1:00 pm at Mustang Stadium. Wilkes falls to 1-7 (1-6 MAC) with the loss. Burrell finished with 74 yards on 22 carries and now has four rushing touchdowns over his last two games. Freshman Brad Harmon was 23-38 passing for 202 yards, with junior Cortez Taylor catching five balls for 59 yards. Harmon hit seven different receivers, who each had at least two catches on the afternoon. Defensively, junior Austin Tennessee and senior Chris Coffie each recorded interceptions, with Tennessee also blocking a field goal in the fourth quarter and breaking up two other passes. Senior Razonte Dunn had a team-high 11 tackles (nine solo), while junior Austin Meyers added eight stops. Stevenson took a 7-0 lead on the first possession of the game after starting at midfield thanks to a 41-yard kickoff return by Salisbury. A seven play, 54-yard drive was capped by a one yard run by Burrell after Harmon found Burrell for a 13-yard completion on the prior play. The third Mustang drive started at the 50 after Tennessee came up with the first Stevenson interception of the game. The guests drove to the 1 before two penalties pushed Stevenson back to the 11. Tim Sternfeld connected on a 27-yard field goal to make it 10-0 with 35 seconds left in the first quarter. Wilkes was pinned at its own 7 with 7:22 left in the second quarter when a four-play drive capped by a 75-yard touchdown pass got the Colonels on the board with 6:00 left before intermission. Stevenson closed out the half with an eight play, 73-yard drive capped by a 39-yard touchdown pass from Harmon to Salisbury to make it 17-7 going into halftime. Stevenson had the lone score of the third quarter, as a two-yard scamper by Burrell with 1:53 left in the frame made it 24-7. The run capped a five-play, 42-yard drive that started with a 23-yard completion from Harmon to Taylor. A fumble recovery set up Stevenson's next score at the start of the fourth. Brady Kempa forced a fumble at the Wilkes 39 that was recovered by Travis Bonds with 1:41 left in the third. On the first Mustang play in the fourth quarter, Kenneth Scott-Kelow completed a 19-yard pass to Devonte Williams to make it 31-7. Wilkes scored on an 11-play, 73-yard drive to make it 31-14 with 11:43 remaining. Following a Stevenson three-and-out, Wilkes marched from its 35 to the Mustang four-yard line before it stalled, and a 22-yard field goal attempt by the Colonels was blocked by Tennessee with 5:45 left. Wilkes outgained Stevenson 372-336, but with the Mustangs forcing three turnovers and not turning the ball over themselves, Stevenson is now +23 in turnover margin on the season. The Mustangs entered Saturday first nationally in turnover margin. Stevenson held a 115-67 advantage on the ground.